Piccoli Passi cooperative with Diomedea Escursioni proposes an amazing trekking program. Every trip start and finish point is Il Baretto on Porto Ferro beach. Diomedea Escursioni professional tourist guides will lead you all along the walk. Price includes insurance for attendants. 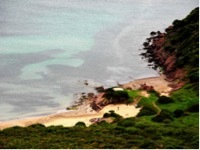 TREKKING PUNTA LU CAPPARONI: from Porto Ferro to Punta Lu Capparoni and back – EE-kind excursion – Duration: about 5 hours – 15 € per person (minimum 2) – Fixed day: Friday.